We all know what to expect from movies based on cartoons, right? A bigger scope, a bigger budget, a new threat, an inexplicable team-up with Courtney Cox? In a lot of ways, Transformers: The Movie hits all those notes. The action is a little more intense, we're jumped 20 years into the future, and the animation quality is improved. Then, towards the end of the first act, or what would probably be the end of an episode if this were broken into separate episodes and aired on TV, Optimus Prime dies. 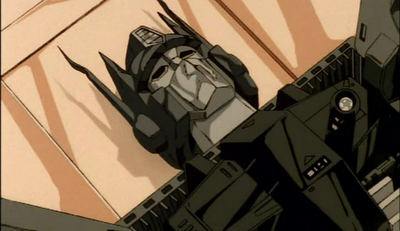 In a summer movie made for children, the leader of the Autobots dies early on and does not return. In a way, it's another marketing ploy from a series that was created to sell toys; the 49 episode 2nd season had introduced hundreds of expendable robots that needed to be swept aside to create new and better toy robots. But killing Optimus Prime shows a commitment to narrative risk-taking that you would absolutely not expect from a franchise built around robots that turn into stuff. It also succeeds in actually raising the stakes- just telling us the good guy autobots are losing doesn't mean a lot to the five year old (or 28 year old fueled by nostalgia), but seeing their hero die heroically at the beginning of the film really drives home that all is not right in Cybertron. Compare that to any summer movie you've seen in the past 10 years--have the villains really won any meaningful victories that made you think "damn, I guess the good guys are really in trouble?" As if the death of Optimus Prime weren't enough, his nemesis Megatron, a guy who shrinks down into a powerful gun, is tossed into space and left for dead by his sniveling second in command Starscream. But Megatron lucks into drifting past Unicron (Orson Welles), an evil robot that transforms into a planet (fortunately, no one confuses him with a moon). 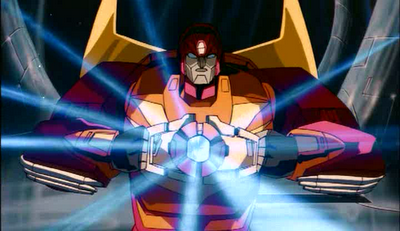 Unicron offers to restore the villain in return for hunting down and destroying something called the "Matrix of Leadership." Apparently killing Optimus Prime wasn't enough, and Megatron, re-made into Galvatron (Leonard Nimoy), is sent to hunt down what's left of Optimus' buddies including Ultra Magnus (Robert Stack), the Autobots new leader. Things get even worse when Galvatron chases down Ultra Magnus and steals the Matrix, but rather than destroy it, he decides to wear it as a fancy necklace as an insurance policy against Unicron. That ends up being important when Unicron starts eating the nearest moon, threatening the lives of basically all the Transformers, good and bad. Meanwhile Hot Rod (Judd Nelson) and his buddies manage to make allies of the dreaded "Sharkticons" and find their way inside Unicron. In a climactic battle with Galvatron, Hot Rod is able to take and use the Matrix, transforming himself into "Rodimus Prime" and destroying the evil planet-sized Unicron, creating a new status quo for Season 3 of the TV show. Critics at the time dismissed the film as silly, which makes sense, since it's based on an underlying concept that is completely ridiculous and only makes sense as a means of selling toys. But despite its inherent goofiness, Transformers: The Movie, takes itself seriously and manages a few moments of genuine gravitas; the fact that it's totally fine to watch a robot get blasted with a laser and then watch the spark slowly drain out of its optical sensors allows the film to show violence on an unexpected scale. The fact that talented actors are delivering this inherently goofy dialogue also elevates it--the show always had strong voice acting, from Peter Cullen, Scatman Crothers, and others, but adding Orson Welles, Leonard Nimoy, Eric Idle, and other 'names' makes the film seem like something special. Or maybe I am just biased because I saw it about 20 times as a child. 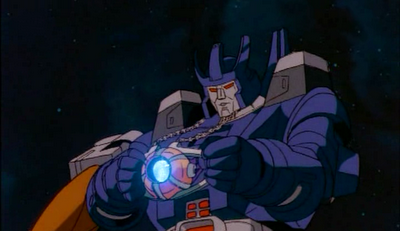 Perhaps the silliest thing in the movie: Unicron's conveyer belt digestive system. 3 energon cubes out of 4. Grimlock: Tell Grimlock about petro-rabbits again. 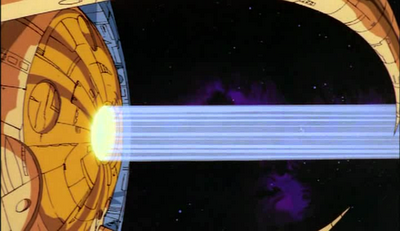 Unicron: Destiny... you cannot destroy... my destiny!